The Bigger Picture on Creation is a study guide is designed to encourage individuals, small groups, Sunday school classes, homeschool co-ops, and other discussion groups to explore Genesis 1-2 and other key passages. Its seven lessons are foundational to building a solid Christian worldview—one that stands the test of secularism and addresses life's crucial questions: Why are we here and where did we come from? What does it meant to be human? How are humans different from animals? Can Christians trust the findings of secular science? Each lesson includes a short video presentation from one of RTB's research scholars connecting the Bible with the discoveries of modern science. 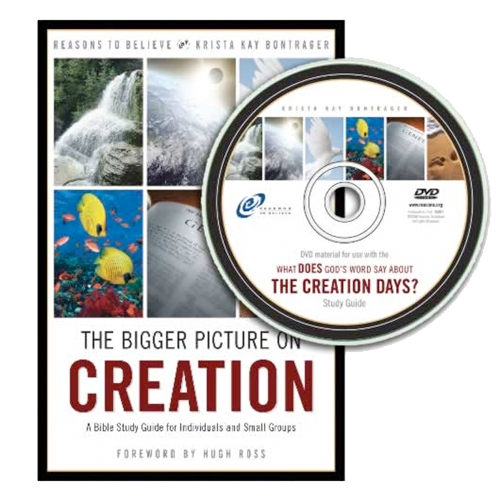 ORDER The Bigger Picture on Creation study guide. SAMPLE CHAPTER: Here's your opportunity to view the list of lessons and a sample lesson even before you purchase the study guide. PODCAST: Hear the author and the RTB staff scholars share their thoughts about how to use this study with your small group. LECTURE NOTES: These optional notes correspond to each lesson's video presentation. They can be downloaded and distributed to your group. Lesson 2 – "In the Beginning..."
Lesson 3 – "And the Earth..."
ANSWER KEY: Download the answer key for the study guide.